Following Money in the Bank, WWE has more or less trod water with storylines barely shifting and a number of guys floating about with not a whole lot to do, part of this was to do with upcoming WWE draft on 19th July, as WWE prepares to make a huge shift in the way it presents it's two major television shows. However, with Vince McMahon making his first appearance since putting his children Shane & Stephanie in joint control of RAW in April, surely things were about to get interesting? With just over a week until the Draft could WWE pull a cracker out of it's bag of tricks? I've seen plenty of nothing matches in my time, but this might have been my first nothing segment. Vince McMahon placed himself in the main event segment, taking up over 18 minutes of television time to tell us that Shane McMahon would be commissioner of Smackdown LIVE, whilst Stephanie McMahon would be take up the same role on Monday Night RAW. It was fairly obvious from when the Draft was announced that we'd get some form of this, with one sibling taking one brand and the other being in charge of the other, but this was one of the dullest ways to finally present this on television. At this point the announcement could have been made on WWE.com or given to any of WWE's favourite new outlets or announced on social media. There was really no need for it to take up so much time on television. Everyone performed pretty well here, character-wise, but there just wasn't enough meat to it. The final couple of minutes were perhaps the most interesting parts of the whole thing, as Vince told Shane and Stephanie that they'd both have to appoint General Managers to their show (seemingly a way to have an authority figure on a show when Shane and Steph are on their jollies) and we finally got to see a burst of sibling rivalry between the two commissioners. Stephanie would slap Shane in the face, begging him to hit her only for "The Boy Wonder" to plant a kiss on her cheek. There's been hints since they both took control but not nearly enough for my liking, it's all been very pass-agg. Personally, I'd have much preferred the draft to have come about as part of a storyline, rather than randomly announced, with the two becoming unable to work with each other, leading to split and Shane taking Smackdown live to compete directly with Stephanie. It's been a bit sterile for my liking. In the show's biggest match of the evening Kevin Owens went over Cesaro, in a good match, following a torture rack neckbreaker. It was odd to see "The Swiss Superman" fall to anything other than the Pop-Up Powerbomb and this almost felt like a way to burst his popularity bubble a bit and knock him down the card. The core part of the contest saw neither man able to take control, as they went back and forth with a series of physical strikes and power moves. There was a lot of contrasts here with the match seemingly very personal at points with the pair throwing each other into and over barricade and really laying in their shots, but then you also had Cesaro running around the ring with JBL's hat on and then nailing a crossbody as the hat flew into the air. It was almost like "The King of Swing" was trying to prove his charisma to those in the back. The match was entertaining but seemed to lack a sense of purpose. The previous match was book-ended by Owens' interactions with rival Sami Zayn as their feud continues to roll on. Owens originally had Stephanie McMahon get Zayn removed from commentary, so the pair would scrap on the entrance way as one entered and the other exited. Of course, there were plenty of referees prepared to remove Sami. All decent stuff, we get a brief glimpse of their feud and things are kept ticking over. There was however more as Zayn would attack Owens after his match, flying over the barricade as Owens went to complete a post-match promo. The scrap was once again a lot of fun, with Zayn chucking "The Prizefighter" into the ring for a Cesaro Swing for a slightly awkward climax. I say "slightly awkward" because I didn't believe that's what Zayn's character would do in that situation, he's supposed to hate Owens guts and for me that didn't come across with his actions here. It was enjoyable, but in my opinion, not right for the situation. Enzo & Cass would win their semi-main with The Club's Luke Gallows and Karl Anderson by disqualification, after AJ Styles got involved to break up a cover, following Bada Boom Shakalaka (Rocket Launcher). The highlight here was a fun back and forth between the two groups before the bell even began, with everyone stepping up to the plate. Enzo Amore and Big Cass' explanation of why they saved John Cena last week was logical and allowed the tag team to not look like underlings to "Big Match John", as they explained they were stepping up to The Club before The Club came to them. There was an energy to the whole that kept things interesting, with Enzo and Cass bringing an element of comedy, whilst remaining deadly serious about their issues with The Club, whilst Styles, Gallows and Anderson tried to place seeds of doubt, regarding Cena's loyalty, in their opponents minds. The fight between the two tandems was just long enough to give the fans an idea of what might go down on 24th July when Enzo & Cass team with Cena to take on the trio. It was a fairly paint by numbers tag bout, with Amore working the Certified G in peril role, after a face shine for Cass, before making the hot tag, which would quickly lead to the finish. Everyone played their role perfectly though, making things compelling to watch and drawing me into the story of the bout. These two teams may be made for each other. With the segment ending with John Cena making a "surprise" run in to make the save for his new amigos, he crowd were hotter for "The Cenation Leader" than I've heard in a long time. A lot of that is thanks to the set-up of the match and the fact that everyone had been saying Cena was getting ready to present an awards show elsewhere. This was my favourite part of the show, I think that we could be in for something really special come the six man tag match at Battleground. A big chance for the Women's division to regain some ground this week, as Sasha Banks made Dana Brooke tap out to the Banks Statement in a twelve minute match. After week's of short and simple bouts it was nice to see the women get a chance to stretch their legs at little and gave us a television audience to see what they can do. Unfortunately, I don't think that Brooke was ready for a match, as she often looked awkward both taking and dishing out offence. She hit an nasty looking slam and didn't seem to know how to take Banks double knee attack. It also looked like she was knackered by the end of things. There were parts of the contest that worked well, like the clever finish where Banks would use her foot on the rope to bring Brooke back to the centre of the ring, keeping the Banks Statement locked on for the eventual victory. A post-match promo by Charlotte uncomfortable to watch as the usually competent Women's Champion seemed to forget her closing line, meaning everyone stood about waiting for the camera to go elsewhere. The show began with a Battle Royal, that would crown the returning Darren Young the new number one contender to The Miz's Intercontinental Championship, in a match that also included Baron Corbin, Apollo Crews, Dolph Ziggler and fourteen other men. Bar some mis-timing by an eager Alberto Del Rio, the match seemed to go off without a hitch, with your usual battle royal fodder of tag teams like The Vaudevillains, The Ascension, The Social Outcasts, The Golden Truth, The Dudley Boyz and The Usos (and lonely Jack Swagger) all being quickly disposed, mostly by Corbin. As is typical with WWE's battle royals things only became interesting once we got down to final four or five, as Crews eliminated ADR, before Corbin literally threw Ziggler over the top rope. An intriguing final three was quickly gone, as superbly worked hip toss spot saw Corbin and Crews' feet both hit the floor. A weird way to debut Young's gimmick and thrust him straight into an IC title match, that he didn't actually do much to earn, but a future feud between Crews and Corbin could establish both men on WWE TV. I can't remember a segment with the WWE Champion featuring lower in one of these reviews, but despite that Dean Ambrose and Seth Rollins produced a fascinating piece of television that more than made use of the 13 minutes that it was given. In first ever Rollins Report, "The Man" showed us his investigative journalism skills by piecing together old Roman Reigns interview footage, with his own questioning, to insinuate Reigns not wanting to be part of the Triple Threat WWE Championship bout on 24th July and also making more than few references to "The Guy"'s wellness policy violation. The last few weeks WWE seems to have been using Rollins as it's mouth piece to stick the boot in on Reigns for his misdemeanor, it will be interesting to see how Reigns is treated on his return. Ambrose's interruption beckoned a brilliant bit of telly, as the two upped their emotions, with Rollins looking genuinely furious that "The Lunatic Fringe" was champion, was Ambrose matched him with a "How far do you think I'll be willing to go to keep [the title]" attitude. 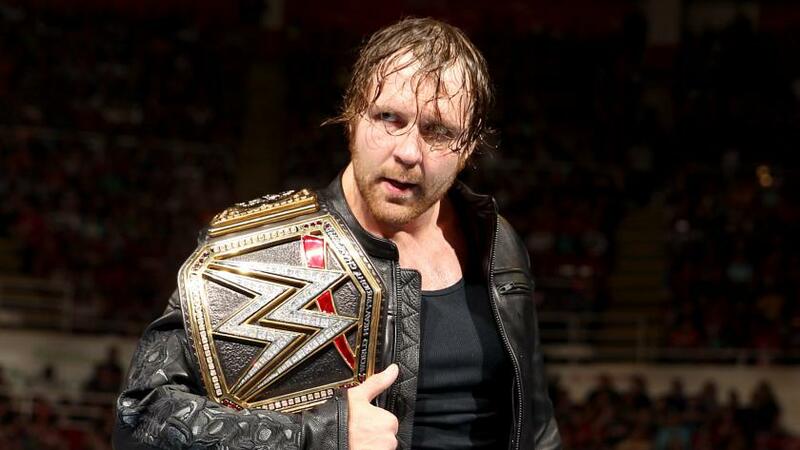 It all concluded with Ambrose agreeing to a One on One title match with Rollins, as WWE baited and switched the Detroit audience, by having Rollins hold off the match til next week! Breezango would pick up a surprise victory over The Lucha Dragons in a match that was better than it had any right to be (despite a botch by Kalisto on a springboard attempt). Sin Cara put together some good stuff with Fandango, as he worked the Dragon in peril role and after Kalisto had recovered from his mistake his comeback sequence was hot also. The finish of the match seemingly came out of nowhere, as Tyler Breeze and Kalisto were allowed to really go for it, with plenty of reversals and back and forth between the two as the fight headed towards it's climax. The finish was the strongest part of the bout, as Cara took out Fandango with somersault senton, before Breeze manage to get the better of Kalisto by tucking his opponent's head between his legs to block a middle rope attack and then delivering a superkick for the win. A big win for the Breezango duo who, regardless of their horrible name, are two talented guys who deserve an opportunity that WWE throws their way. In a what on earth is going on match, Sheamus would squash Zack Ryder (after earlier attacking him backstage) with a Brogue Kick, before United States Champion Rusev would further attack "The Long Island Iced Z" locking him in the Accolade. "The Bulgarian Brute" would accept Ryder's challenge for a US title match whilst machka-ing him in the submission. I couldn't work out the logic here, I kind of understand wanting to re-build Rusev and Sheamus following the League of Nations debacle, but I'm not sure this really did either any favours in the long term. WWE have squeezed all they could out of Ryder's WrestleMania IC title win and without another victory soon he's going to end up back in the same position he was before. In another squash match, Titus O'Neil would look to regain the momentum he'd lost in his feud with Rusev, by picking up a win over Heath Slater. SLATER GATOR EXPLODES! Call your friends, Wilfred. Ummm, yeah, this was a match. I don't want to rip into it, because I respect the hard work that Slater went to to make O'Neil look his absolute best. Seriously, Slater was flipping around off clotheslines and hitting the mat like he was getting paid by the bump. I dislike O'Neil so much that I found myself rooting for Slater and hoping he'd get the upset on ever near fall, including a well placed DDT by the One Man Band, but sadly it wasn't to be and O'Neil closed the match with a Clash of the Titus. Elsewhere, The New Day went to visit The Wyatt Family, in a segment that appeared to have been influenced more than a little by TNA's Final Deletion, with a cinematic feel and incidental music, but lacked a lot of the humour and sheer wackiness of Matt and Jeff Hardy's garden based epic. An improvement on last week's Independence Day special, but that is a back handed compliment if I ever heard one. Out of the three main segments the show presented (McMahon's, Cesaro v Owens ft. Zayn, Enzo & Cass v The Club ft. Cena) the only one that truly managed to deliver was the tag bout, that was full of energy, and remaining entertaining through the lead-in promo, into the match and climaxing with John Cena's well-timed surprise save. Weirdly stuck in the mid-card was the WWE Championship segment with Dean Ambrose and Seth Rollins that was red hot and the best thing on the show, that in my opinion should have closed the show, instead of the McMahon family circle jerk. Outside of that you had a scrappy Women's match, and the two squash matches won by Sheamus and Titus O'Neil dragging the show down, with more bizarre pieces of booking elsewhere, as WWE seems to be panicking as they head towards a Draft on 19th July and a PPV on 24th July! Also notable is that last week's main eventers, Chris Jericho, Kane, Mark Henry and The Big Show were all absent this week. BIG SHOW WAS ONE OF THE TWO REMAINING THE PEOPLE IN THE MATCH...The other one got squashed in minutes by Sheamus this week. As if I needed anymore reasons to hate that match.